The Ki-43 was the most widely used Army fighter, and equipped 30 sentai FR,(flight regiment) and 12 chutais IS,(independent squadrons). The first unit equipped with the Ki 43-I was the 59th FR at Hankow Airfield, during June–August 1941 and began operational sorties over Hengyang on 29 October 1941. The second unit to re-equip with the new Aircraft was the 64th FR, from August to November 1941. The first version, Ki-43-I, entered service in 1941, the Ki-43-II in December 1942, the Ki-43-II-Kai in June 1943, and the Ki-43-IIIa in summer 1944. The aircraft fought in China, Burma, the Malay Peninsula, New Guinea, the Philippines, South Pacific islands and the Japanese home islands. Hayabusas were well liked in the JAAF because of the pleasant flight characteristics and excellent maneuverability, and almost all JAAF fighter aces claimed victories with Hayabusa in some part of their career. At the end of the war, most Hayabusa units received Ki-84 Hayate "Frank" fighters, but some units flew the Hayabusa to the end of the war. The top-scoring Hayabusa pilot was Sergeant Satoshi Anabuki with 39 confirmed victories, almost all scored with the Ki-43. This is not a new kit with the initial release being 1969. However, despite the raised panel lines, the kit itself looks to be very good and the moldings are in super shape. I'm not sure just which boxing this is as there is no date on it or the instructions or decals. The box information is basically in Japanese as is the painting instructions, but the build instructions are all in English. I will guess early 1970s. 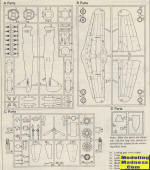 Looking through the instructions I noticed that this kit can either be built as a Ki-43-IIa or Ki-43-IIb. The visual difference is that the a model has the collector exhaust coming straight out of the side of the cowling, while the b version has a longer exhaust pointed back as shown on the box art. As you many have read, the b version can carry drop tanks while both can carry bombs. Both items are included in the kit. The kit comes with a relatively nice engine that has separate cylinders. Both banks are built up and the intake or exhaust piping is added before they are mated as are the pushrod assemblies. The Ki-43-IIa has a circular oil radiator that fits in the very front as on the earlier -I Hayabusa. 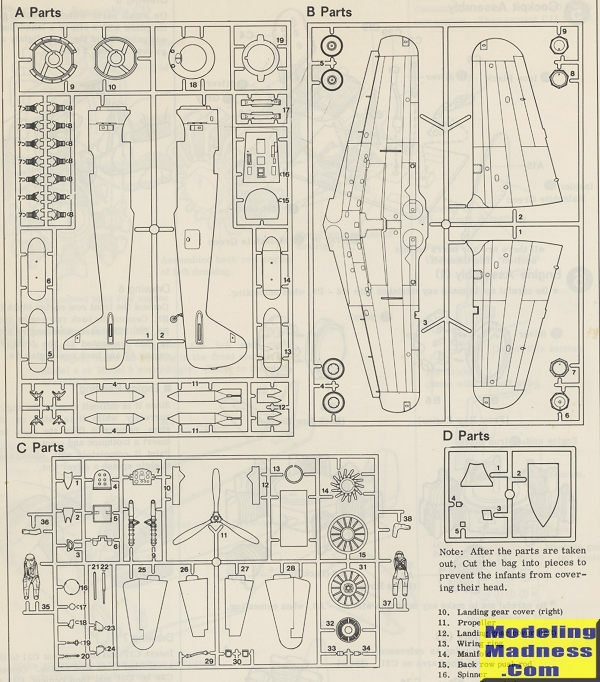 Now would be a good time to mention that one has to cut the fuselage for the exhaust that you choose so you need to decide early in the build if you will be doing an a or b version. A well done interior is provided with all the usual accoutrements and controls. The inside of the fuselage halves has some nice detail as well. 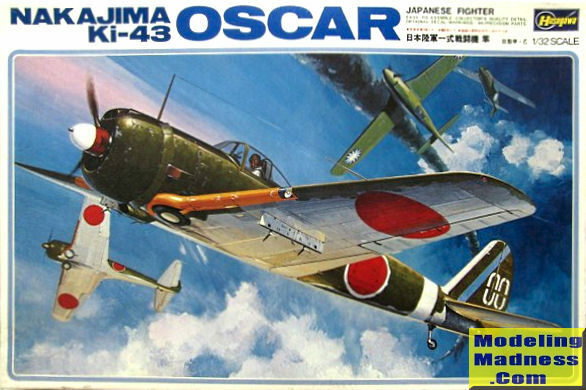 In line with other large Hasegawa kits of this era, a pilot figure is included. The wings are already slotted for the racks so those will need to be filled if you don't want them on your model. Other model a and b differences are the lower cowling cooler intake and the size of the head rest. There is a separate windscreen and canopy so you can pose the canopy open if you wish. The instructions are very well done with lots of detail drawings to help keep things properly aligned. All the color information is generic and Hasegawa calls for the interior to be either grey or malachite green. I suppose it was probably Nakajima interior green. There are markings for four aircraft. 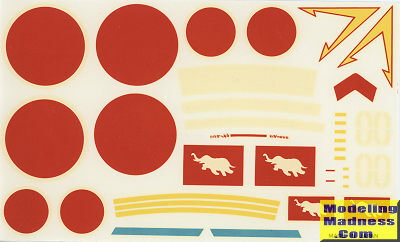 A full color placement guide is provided this showing a green camouflaged plane, an unpainted metal plane with the IJAAF and a tiger painted plane with the Manchurian AF. The fourth is the box art plane. The decals may still be usable, but I'd go with aftermarket for this one just to be sure. To my eye the colors on the kit sheet are too light/bright. No unit information is provided. The sheet image has been darkened a bit to hopefully show some of the white (actually off white) markings.